For the final section of this very scenic route, we leave behind the Arlberg Railway and reach Feldkirch, a pleasant medieval city on the border with Switzerland and Liechtenstein. It is nestled in a picturesque place where three valleys meet and includes a well preserved old town and the dominating edifice of the ancient Schattenburg Castle. It is also the best jumping-off point for exploring Liechtenstein which can be easily reached by bus. The buses are reasonably priced and transport you up into the hills for wonderful views to the sounds of cowbells, and onwards into Switzerland if you wish. Next is Bregenz, the capital of the Vorarlberg region, which lies on the eastern shores of Lake Constance, the third-largest freshwater lake in Central Europe. From April to October, Vorarlberg Lines offer a number of sightseeing lake cruises, which can be especially beautiful at sunset. Just off shore is the city’s floating Lake Stage, home of the famous Bregenz Festival held each July and August. The festival is one of Europe’s most popular, featuring prominent operatic figures and major musicians and orchestras. The city itself lies at the base of the Pfänder Mountain. A six minute ride on a panoramic gondola takes you to the summit from where you enjoy fantastic views of the Swiss Alps, Lake Constance, and surrounding mountains. On a clear day, some 240 mountain peaks can be visible. The final stop on this route is Lindau. This historic town is actually an island on the eastern side of Lake Constance and connected to the mainland by a road-traffic bridge and a railway dam leading to Lindau Hauptbahnhof. Full of medieval and half-timbered buildings it’s a popular tourist attraction, especially during summer. Boat tours are available from the pretty harbour, home to a famous lighthouse which is well worth a visit, or you can just sit and admire the view of Austria and Switzerland and the Alps across the lake. Lindau also provides you with a connection to another scenic railway, the Bavarian Allgäu railway (Table 935) which runs through southern Germany to Munich. This month we are looking at a route that consistently appears in any top ten of the best scenic rail routes in Europe. Table 951 from the timetable can be used to plan your journey through stunning Tyrolean Alpine scenery. Beginning in Salzburg the route heads towards Innsbruck taking a route which passes briefly into Germany via Rosenheim, then along the beautiful Arlberg railway finishing on the eastern side of Lake Constance in Lindau. Following on from Jenbach the route now heads to the stunning city of Innsbruck and the start of the Arlberg Railway. Innsbruck Hbf is one of the busiest stations in Austria with around 450 trains passing through the station daily. As soon as you step onto the platform you are met with views of the mountains on one side and the Bergisel Olympic ski jump on the other. The delightful old town (Altstadt) offers access to the main tourist attractions, including the famous Golden Roof, a balcony which gets its name from the 2,657 fire-gilded copper tiles that adorn its roof. Nearby is the elaborate Gothic Imperial Palace and Imperial Gardens with its giant chess boards and diverse plants and trees. Reaching the mountains is easy, with a ride on the spectacular modernist Hungerburgbahn funicular from the city centre followed by a series of cable cars to whisk you to the summit of the Nordkette range for one of Europe’s most impressive vistas. The 157 kilometres from Innsbruck to Feldkirch are the most spectacular of the entire route. The line climbs to over 1,200 metres above sea level (one of the highest lines in Europe) following the course of the Inn River to the busy hub of Landeck where we then enter the mountain section of the Arlberg Railway. In this section trains pass through 14 tunnels and 20 galleries that serve as protection from falling rocks and avalanches. One of the most iconic moments is crossing the iron arch of the Trisanna Bridge, just outside Landeck. Raised 87 metres over the river valley, the bridge is overlooked by Schloss Wiesberg, a 13th-century castle set on a woodland cliff. Between the major ski resorts of St. Anton and Langen a popular playground for Europe’s Royal families, is the 10,249 metre long Arlberg tunnel, where we leave the Tyrol and enter Vorarlberg. If skiing is not your thing, or you are visiting in the Summer, this area offers plenty of spectacular walking routes, boating, bathing lakes and other sporting options. Leaving Salzburg, we travel 120 kilometres through pretty Bavarian countryside directly to the border town of Kufstein. As there are no stops within Germany there is no requirement for border controls. Known as the “Pearl of the Tyrol”, the medieval town of Kufstein is situated between the Brandenburg Alps and the Kaiser Mountains. Its greatest landmark is the Kufstein Fortress situated high above the city and is reached via the Festungsbahn funicular railway. The fortress now houses a museum and is worth a visit for the stunning view over the town and nearby mountains. Next is Jenbach, the starting point for two narrow gauge railways. This makes an unusual station as there are tracks with three different gauges: the standard gauge railway line of the ÖBB, the 1,000 mm gauge Achenseebahn (Europe’s oldest steam cog railway) which transports tourists along seven kilometres to Lake Achensee (Table 956) and the 760 mm narrow gauge Zillertalbahn (Table 955). At Lake Achensee timetables are co-ordinated so that passengers can transfer to the steam boat ferry to continue their scenic exploration of the area. This month we are looking at a route that consistently appears in any top 10 of the best scenic rail routes in Europe. Table 951 from the timetable can be used to plan your journey through stunning Bavarian Alpine scenery. Beginning in Salzburg the route heads towards Innsbruck taking a route which passes briefly into Germany via Rosenheim, then along the beautiful Arlberg railway finishing on the eastern side of Lake Constance in Lindau. There are two rail routes between Salzburg and Innsbruck, the other route, shown in Table 960, remains entirely in Austrian territory but is slower and trains are less frequent. With both routes offering some wonderful scenery travellers are spoilt for choice and could perhaps chose the alternative route for a return journey. Salzburg Hbf our starting point is a 20 minute walk from the city centre. This major rail hub has a wealth of domestic and international connections including to Wien (Table 950) and Munchen (Table 890). Because it lies on the border with Germany, the station is administered jointly by Austrian Railways (ÖBB) and German Rail (DB). Seat reservations are optional on most trains but cheaper tickets can be purchased by pre-booking. Salzburg is a tourist favourite, famous as the birthplace of Mozart and the setting for The Sound of Music the number of tourists can outnumber locals by a large margin in peak times. The city is also internationally renowned for its baroque architecture with the historic centre being listed as a UNESCO World Heritage Site. The must see Hohensalzburg Fortress towers over the town and is one of the largest medieval castles in Europe. Reach it via the Festungsbahn, Austria’s oldest funicular railway. At the top visitors get fantastic views of the city and surrounding mountains. 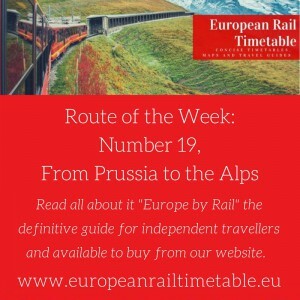 As a continuing feature we will be highlighting a selected route from our guidebook ‘Europe by Rail’ written by Nicky Gardner & Susanne Kries, every week. Below is an extract from the book. To find out more, the guidebook can be purchased through our website for £15.99. This week we are looking at: Route No. 19: “From Prussia to the Alps” which begins in Berlin, passing through Leipzig and Munch, ending in Salzburg. This long journey from Berlin to Bavaria and on across the Austrian border to Salzburg takes in some very fine German cities (including Leipzig, Weimar and Munich) and some decent countryside – of which the two highlights are the hill country of Thuringia in the middle of the route and the Chiemgau area of Upper Bavaria. The latter gives a grand finale to the journey on the approach to Salzburg. It is just 150 kilometres from Munich to Salzburg, but what a journey! Sit on the right side of the train for fine views of the Alps as you approach Salzburg. Closer to the railway, and on both sides of the train, are the delicate landscapes of the Chiemgau. It is a stunning end to a journey which started on the banks of the River Spree in Berlin and ends by the Salzach near the Austrian-German border.